On May 4, 2013, my brother, Jim, went to the doctor with what he thought was the flu. He passed out in the doctor’s office and was rushed to the medical center in Appleton, WI where he was diagnosed with pneumonia and an aggressive form of leukemia called Acute Myeloid Leukemia (AML). He was admitted to the hospital where he began a rigorous course of chemotherapy that had him in the hospital for six weeks, three of them in ICU. Our family rushed from California to be at his side and haven’t left him since. We learned that Jim needed a bone marrow transplant. 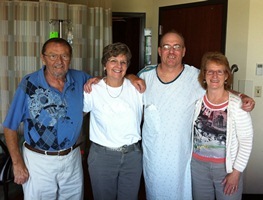 This posed two challenges for us – finding a good marrow match for Jim and figuring out how to pay for the transplant. Doctors informed us that full siblings are the best chance for a good match. Since Jim was adopted at six weeks old from a teenage, unwed couple, the hope of finding siblings was a real long shot. In May, we started the process of searching for Jim’s birth family. All we knew was that his birth mother had requested placement in a middle class, loving, Protestant home with siblings, and preferably one with music in the home. She even carefully chose the outfit he should wear when he came to us. The ALMA Society in Sac County was able to track down Jim’s birth family and I made contact with them in mid-June. Jim’s birth parents, Sharon and Allan, were 17 and 18 when she got pregnant. They wanted to marry and keep Jim but she was made to go to a home for unwed mothers and give him up. She even wrote a letter she wanted included in the adoption papers saying that she would like to be informed of his progress as life went on. The letter was destroyed. Sometime later, Sharon and Allan married and had two more children. Jim has a full brother and sister who didn’t know he existed! I was delighted to tell Jim’s birth mother what kind of boy and man he was and she said he sounded like her daughter. She was so pleased. She said that she believes everything happens for a reason and that she was glad Jim had been raised in our family. My parents and Jim are over the moon about finding his birth family and Jim’s children Andrew and Sydney are excited to get to know their new family, too. Allan and Sharon met with Jim’s sister Heather soon after we first spoke. She was told she had an older brother and that she might have a chance to save his life. Heather agreed to have the bone marrow test immediately to see if she was a match. We patiently waited for weeks, and then we got the results that Heather is a match and she has agreed to donate bone marrow to him! She is surmounting her own obstacles to do this for Jim, including shots for six straight days and two trips from California to Wisconsin. She is our hero! So now we are facing the challenge of financing this transplant. Later in the summer, when Jim has this procedure, my parents will need to stay in a hotel or apartment near the hospital. Heather will need to fly to Wisconsin as well. Jim will also have significant out of pocket medical expenses. To help with this financial burden, a fundraising campaign in Jim’s honor has been established with HelpHOPELive, a nonprofit organization that has been assisting the transplant community for 30 years. All donations are tax-deductible and are administered by HelpHOPELive for transplant-related expenses only. Please be our hero. Jim needs your help. To donate by credit card, select the DONATE NOW button or call 800-642-8399. In the meantime, we rejoice in the healing that is happening, in the selflessness of Heather, in the love of parents that give up their lives to care for their children, and in the hand of God as He is in all of this. Thank you for your continued prayers. Your support means everything! October 15 – According to his bone marrow biopsy, Jim is Leukemia free and has 100% of Heather’s bone marrow! Things are looking up, friends!